Yesterday was the first day of school for my oldest son. The night before I was so worried he would be nervous about meeting new people and being at a brand new school without his old friends. All that night, I kept thinking about the rainy night he was born. It seems just like yesterday he was my little baby and now he is almost 5 years old. I don't know why but it seems like once children enter school the years go by faster. He got up that morning with his fresh hair cut and eyes all bright excited to carry his new CARS backpack to school. We attended open house the afternoon before and my husband and joined the PTA. Jalen met his teachers and some of the students. When we got to the school, we all walked him in as a family. He even directed me, his dad, and his brother down the hallway to his classroom all on his own. When we got ready to leave, we said our good-byes for now and I almost started to cry, but I held it tog ether. On the other hand, my youngest son began to cry and my husband had to pick him up. I picked him up at the end of the school day and his teacher brought him right to my car. He had the biggest smile on his face. He and his teacher said they had a wonderful day. I was so happy to here that, because it made it easy for me to let him go this morning. Well, I know I haven't blogged much lately, but I don't have much to talk about right now. I have been knitting, but not a great deal. I also know I haven't posted photos of the finished Dress with Eyelets from the Baby Knits for Beginners book by Debbie Bliss. But I will. Not Much Knitting, But Something To Celebrate! Well, I haven't done much knitting the past few days. I have just been so tired. I am still excited about knitting my Sweet Pea Sacque and Cap set, but sleep just gets to me after the kids are in bed. My oldest some will be starting school in just 2 weeks and everyone in the house is all a buzz. Jalen and I went to his kindergarten orientation this morning, and he wanted to take is backpack and all his school supplies with him! I told him, he only had a few more days and his wishes will come true. He just smiled at me. Yesterday, August 12th was my husband and I seventh wedding anniversary! We didn't do much. He did have yesterday and today off from work and he took the whole family out to lunch - which was wonderful. No cooking for me!!! Sometimes, I can't believe it as been 7 years. Then I look at the kids. They are a great reminder of how much I love my husband and the family we chose to create. Completing One Project, Only to Start Another. Well, I just finished the Dress with Eyelets and it looks pretty good I think. I did make some modifications to the pattern. I will post my highs and lows of this knitting experience later, with photos of course. But I did start another new project this week. The Sweet Pea Sacque and Cap kit I purchased from JimmyBeansWool.com. The kit came with the pattern and the yarn to complete the project. I chose the yarn Rowan Cashsoft 4Ply RYC in color 436 Fennel a Cedar Green and it is really a pretty shade of green. 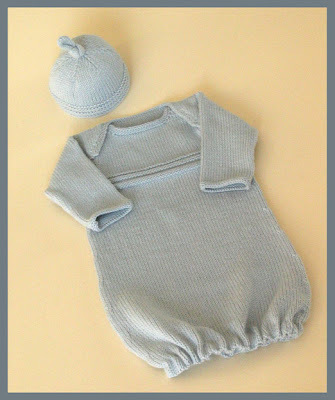 I am not a huge green fan, but people seem to always go for pastel colors when it comes to baby items and I wanted to knit something different. I'm not sure what I will do with this project, but it is nice to knit these cute little goodies for someones bundle of love.